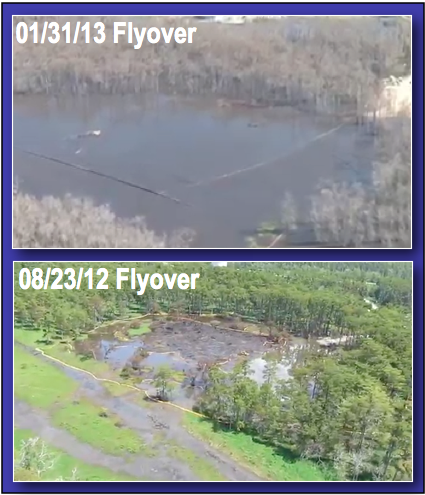 There has been scant coverage on the Bayou Corne Sink Hole which began back in August 2012. One has to really wonder why there is not more national coverage of the disaster. Baton Rouge, La (NBC33) — A Senate committee meeting is being held at the State Capitol today and it’s one that people in Assumption Parish have been anticipating. The focus of the meeting scheduled by the Senate’s Natural Resources Committee is the Bayou Corne sinkhole, which has consumed roughly 9 acres of land since it was discovered. The sinkhole was first noticed on August 3, 2012. It is believed to have been caused by a failed brine cavern owned by Texas Brine, Co.
Today, a representative from the Department of Natural Resources advised that the sinkhole is likely to grow larger before the problem is fixed. Over a hundred residents have packed the committee room and are expressing their fears and frustration with the continued issues. They say their lives have been disrupted for the past 7 months. This is the ninth article in this Opednews series by Meryl Ann Butler about the Bayou Corne sinkhole. BACKGROUND: In Spring of 2012, Louisiana’s Corne and Grand Bayou residents noticed strange bubbling in the bayou for many weeks, and they reported smelling burnt diesel fuel and sulfur. Then suddenly a sinkhole the size of three football fields appeared on Aug. 3, swallowing scores of 100-foot tall cypress trees. The sinkhole resulted from the failure of Texas Brine Company’s abandoned underground brine cavern. The Department of Natural Resources issued a Declaration of Emergency on Aug. 6, and 150 families were evacuated. Napoleonville, LA: The nightmarish Louisiana sinkhole in Bayou Corne continues to swallow up land on its perimeter. Around mid-day on Feb 12, the newest cave-in was reported. An estimated 50 x 100 foot section caved in on the southwest side of the sinkhole. The most recent cave-in prior to this one was reported on Dec. 12, 2012. Increased and abnormal seismic activity over several days was reported on Feb. 4, 2013. Increased seismic activity had also been reported on Jan. 19, 2012. In contrast, when the sinkhole first formed on Aug. 3, 2012, it was said to be approximately the size of three football fields, or about 3 acres. The Texas Brine representative also noted, “we are making good progress on the containment of the sinkhole…it appears to be more stable now than it was a couple of months ago” but did not elaborate on how “progress” was determined, since the seemingly unstoppable sinkhole has continued to grow. Houmatoday.com notes that “It will take more than two months for scientists to get a better idea of the dangers a sinkhole poses for the Bayou Corne community.” Meanwhile, many changes are expected in the sinkhole area over the course of two months. As of mid-February, the Bayou Corne sinkhole had swallowed nine acres. Scientists say the worst-case scenario is it could swallow 40 acres. Published: Sunday, March 3, 2013 at 2:18 p.m.
BATON ROUGE — Studies of the area where a sinkhole formed last summer in Assumption Parish indicate scientists suspected as early as 1991 that the Napoleonville Dome was not shaped as state regulators believed when they permitted industry to create caverns in the massive underground formation. The shape of a salt dome is important because it dictates where to safely locate caverns created by pumping water underground to dissolve the salt, leaving empty space. Such caverns — often filled with oil, natural gas or brine — can become structurally unsound if too close to the edge of the salt formation in which they are carved. Scientists now think that’s what caused a Texas Brine Co. cavern to collapse in the Napoleonville Dome more than 5,000 feet beneath the surface. Scientists hired by the state to study the collapse believe the failure of the salt wall separating the cavern from the surrounding natural formations allowed millions of cubic yards of rock and other material to flow into the cavern. The collapse deep underground caused the sinkhole to emerge near Bayou Corne in August, according to their scenario. About 350 people remain evacuated from their homes because of safety concerns. The sinkhole continues to grow, and natural gas is still bubbling up in swamps and bayous. The collapse of the Texas Brine cavern has changed regulators’ view of the dangers of locating caverns too close to the edge of salt domes, said Patrick Courreges, a spokesman for the Louisiana Department of Natural Resources. Environmental activist Erin Brockovich and a California attorney hired by 25 Assumption Parish residents evacuated due to a giant sinkhole near Bayou Corne are heading to Pierre Part on Saturday to talk to other residents about their legal options, the attorney said Monday. Thomas V. Girardi, a personal injury lawyer in Los Angeles, said he and Brockovich will attend Saturday’s community meeting at the American Legion Hall, 3336 La. 70, Pierre Part, to answer questions about the Texas Brine sinkhole in northern Assumption Parish. Brockovich was portrayed by actress Julia Roberts in the 2000 feature film “Erin Brockovich” shot by former Baton Rouge resident and Oscar-nominated filmmaker Steven Soderbergh. It tells the story of then-legal clerk Brockovich’s fight against a California power plant in the exposure of nearby residents to contaminated ground water. Girardi was one of the attorneys who worked with Brockovich and secured a $333 million settlement for 650 residents of Hinkley, Calif.
“We are still looking into it. Our investigation is still going on,” Girardi said. Five lawsuits were filed last year by residents and large landowners in state and federal court over the sinkhole. Texas Brine has pushed to keep all the cases that were filed in state court in federal court. Four of the cases have been consolidated in U.S. District Court in New Orleans before Judge Jay Zainey, including one state court case that the plaintiffs had previously sought to keep in Assumption Parish. On Feb. 22, Zainey also moved the fifth case, which was filed on behalf of large landholders originally in state court, from federal court back to the 23rd Judicial District in Assumption. A steering committee of plaintiff’s attorneys led by Denham Springs lawyer Calvin Fayard Jr. also has been established to help direct the federal litigation. The plaintiffs plan their own meeting with their clients Tuesday, said Blayne Honeycutt, one of the plaintiff’s attorneys. The failure of a Texas Brine Co. LLC cavern, known as Oxy Geismar No. 3, is believed to be the cause of the sinkhole and other related developments, including gas becoming trapped underground in the vicinity of the sinkhole. About 350 residents remain under evacuation orders in the Bayou Corne and Grand Bayou communities. by movement of sedimentary rock migrating into the failed cavern. Located near the edge of the salt dome, the Texas Brine cavern underwent a sidewall collapse at a depth of more than 5,000 feet that has allowed millions of cubic yards of rock to flow into the brine-filled cavity. This shift in the earth led to the formation of the sinkhole, found Aug. 3 in a swampy area of northern Assumption Parish. When asked about Girardi and Brockovich’s planned visit to Assumption Parish on Saturday, Texas Brine spokesman Sonny Cranch said Monday that the company had no comment. Girardi said Monday that the residents whose lives have been affected by the sinkhole need some relief. “It’s a terrible story. Those people have been totally wiped out. It’s more than losing a house; there’s the mortgage, the interest, it’s just a big mess,” Girardi said. Girardi said he and Brockovich were asked to attend Saturday’s meeting by some of Girardi’s Assumption Parish clients in the sinkhole case. “They said other people had questions and were interested in talking with us,” Girardi said. David J. Mitchell contributed to this report. some of the best dive sites not only in the Philippines but in the world. You want personal tuition for something as important as this, and you want your course to be really enjoyable.